Department is a division of employees that may define the hierarchical structure, geographic regions, or functional groups within your organization. If you plan to implement departments, you should define your departments before setting up your employees, allowing you to add an employee and assign the employee a department in one easy step. Click Departments icon under Organization Setup. Click Add Department green button at the top right. The Code of your new department. e.g. you can enter short form of Information Technology like IT. If you’re not using department code, just leave it blank. The Name of your new department. Don’t worry, you can always change this later. Now click the green Add Department Button. Your new department will be created and then immediately appear on your Department screen. Click Options with Gear Icon against the Department you want to Edit/change name then click Edit Department. Change the Code of an existing department. Change the Name of an existing department. After making changes, click Update Department Button. 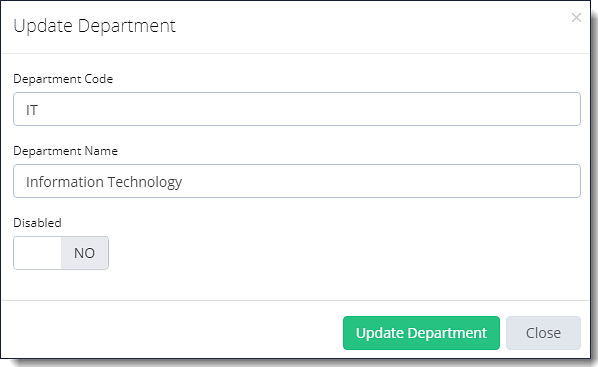 Department will be updated and then immediately appear on your Department screen. Click Options with Gear Icon against the Department you want to Edit/change name then click Edit Department Button. Click Options with Gear Icon against the Department you want to Delete then click Delete Button.